Rising up beside Potala Palace (bù dá lā gōng 布达拉宫), the spied peak of Chakpori Hill (yào wáng shān 药王山) is 3725 meters high. Ascending the winding path to the top, one has the opportunity to view a panorama of the ancient city and its surrounding landscapes. 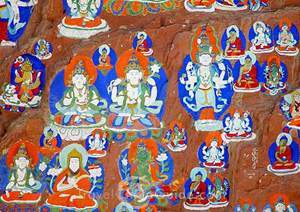 Quite a few figures of Buddha, gods in different poses, and Buddhist scripture in Tibetan characters are engraved on the cliff. There is an extremely well preserved grotto with a history of more than a thousand years on the southeast mountainside. The grotto is 27 square meters and in the shape of unequal rectangle. There are 69 stone statues engraved on the rock, vivid and lifelike, which represent the soul of Tibetan stone inscription art. At the north foot of the mountain is a spring. The fountain, pure and sweet, was named "Holy Water". It is said that the fountain was the favorite of the Dalai Lama half a century ago. During the middle of 17th century, in the early Qing Dynasty (qīng cháo 清朝), a temple was erected on the top of the mountain. Within this temple was placed a sapphire figure of a certain Tibetan Medicine King (xī zàng yào wáng 西藏药王). Legend has it that the King was the avatar of Sakyamuni (shì jiā móu ní 释迦牟尼), who was able to treat patients no matter what the disease or how difficult the cure. 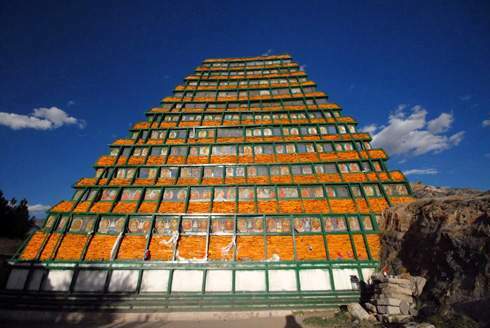 During the period of the Fifth Dalai Lama (dá lài lǎ mā 达赖喇嘛, 1642-1682), lamas from all over the country were brought to this temple to systematically study and coordinate the knowledge of traditional Tibetan medicine. Later, the temple became the Tibetan Medicine Bureau, but over time it fell into ruin. 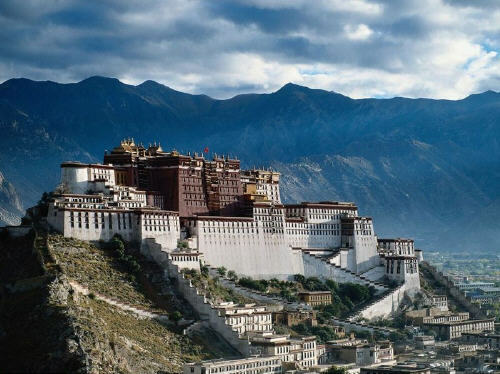 Chakpori Hill is also the ideal location for taking photographs of Potala Palace. In the early morning of holidays, dense crowds of photographers and photography aficionados come here to shoot a rare view of Potala Palace irradiated by the first rays of the sun. These days Chakpori Hill has become one of the hot tourist destinations in Tibet. Every year, millions of visitors from both home and abroad will pay a visit for both sightseeing and historical interests. In old stories, the stone on the top of the hill was the place where Princess Wencheng (wén chéng gōng zhǔ 文成公主) prayed to the east when she missed her hometown. The grotto was carved from the period of Songsten Gampo (sōng zàn gān bù 松赞干布). It is said that when the queen of Songsten Gampo Ruyong (rú yōng 如雍) carved the figure of Buddha, whey used salt which was lack of in Tibet at that time as the . If the artists carved 1L powder of the stone, they would get 1L salt. It’s very dark inside the grotto. The only lights come from the oil lights. So if you want to have a look at the perfect carves, don’t forget your headlight.